How do I transfer music from iPhone to itunes free on Mac or Windows PC? It is truly amazing to download thousands of songs on your iPhone and you can enjoy your favorite music anywhere and anytime. 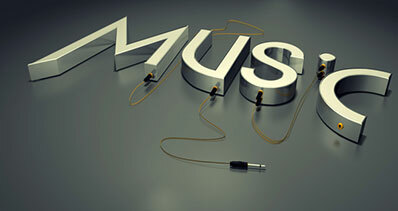 For many users, music is one of the most crucial content on their iPhone as it makes them relax. And if this case all applies to you, then it is always a good idea to take backup of your most important data to avoid any type of data loss. Moreover, if you wish to enjoy your favorite songs on your computer too, then all you have to do is to transfer music from your iPhone to the computer. Luckily, Apple has given the official and free way to do this and it is iTunes. Here, in this article, we are going to tell you how to transfer music from iPhone to iTunes free without any hassle. In fact, if you want to transfer music from your iPhone to iTunes without using iTunes, then this article has also a way for you. Even though iTunes can’t transfer non-purchased music from iPhone to iTunes, it offers an easy method to transfer the music you purchased from iTunes store from iPhone to iTunes. 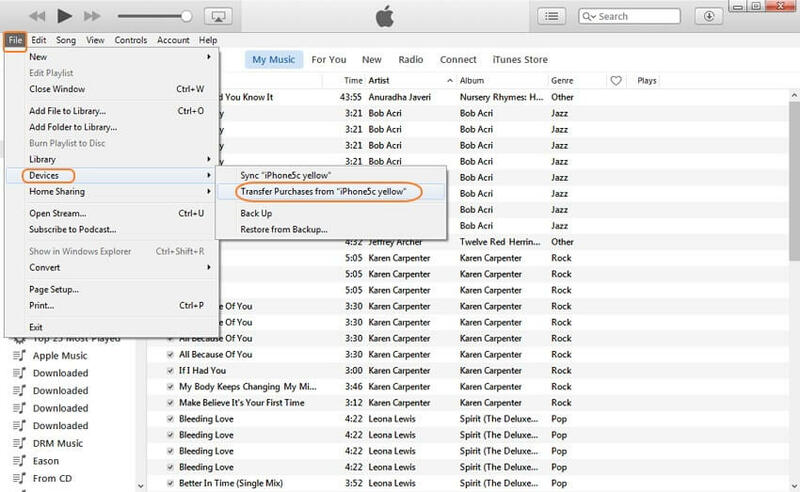 So, If you have purchased some songs via iPhone from iTunes store and now, want the purchased music on your computer, then you can transfer the purchased music from iPhone to iTunes via iTunes itself. Step 1 : To begin the process, download and install the latest version of iTunes on your system and then, run the iTunes. Step 2: Next, navigate to the “Account” and then, “Authorization”. After that, select “Authorize This Computer” option so that your system gets access to your Apple ID. Step 3: After that, sign-in with your Apple ID and password and then, tap on the “Authorize” button to finish the authorization process. Step 4: Thereafter, connect your iPhone to the computer using a digital cable. And choose “File”> “Devices” and then, select “Transfer Purchases from [Your Device Name]”. Step 5: Once the process completes, tap on “Recently Added” located on the iTunes left the panel in order to check newly transferred songs. Note: Remember that this feature is only for music purchased from the iTunes store. 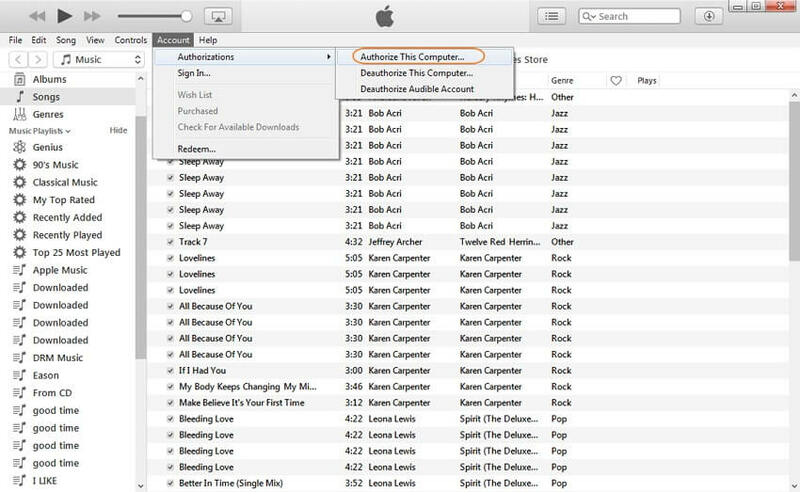 The songs you purchased from other sites or sources will not be transferred from iPhone to iTunes. So, if you want to transfer both purchased and non-purchased songs from your iPhone to iTunes, then refer to the new part. If you want to transfer purchased as well as non-purchased music from your iPhone to iTunes, then iMusic is here for you. It is a music management tool that let you transfer all songs, which include songs you purchased from iTunes Store, downloaded from other apps, songs stream from cloud-based services, and much more from iPhone to iTunes library on your Mac/PC. 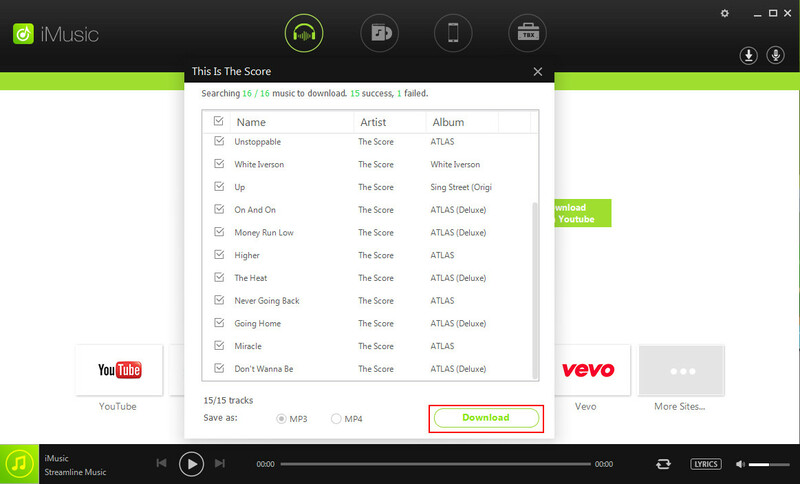 In fact, it is also a great music downloader and manager that can easily record, download and manage music. With this tool, you can transfer music not only from iPhone to iTunes but from iTunes to iPhone also. Free Trial to Move Music from iPhone to iTunes Easily. 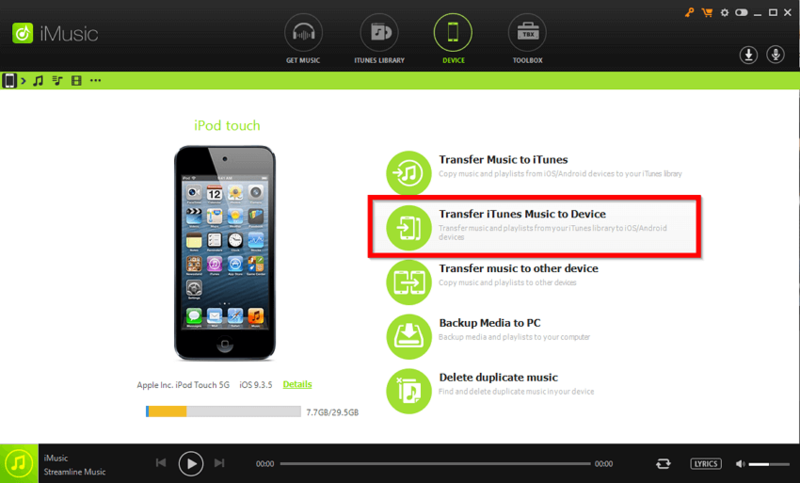 Transfer music between Android/iPhone/iPod/iPad and Mac/PC/iTunes without much trouble. Include all the tools you require to manage your download or purchased music. Download music from various sites, such as Archive, YouTube, and many more. YouTube batch download is also possible and it is effective as it can download over 600 songs at one time. Supports a wide range of file formats, which include MP3, WebM and many more. First, download and install the software from its official site on your Mac computer. 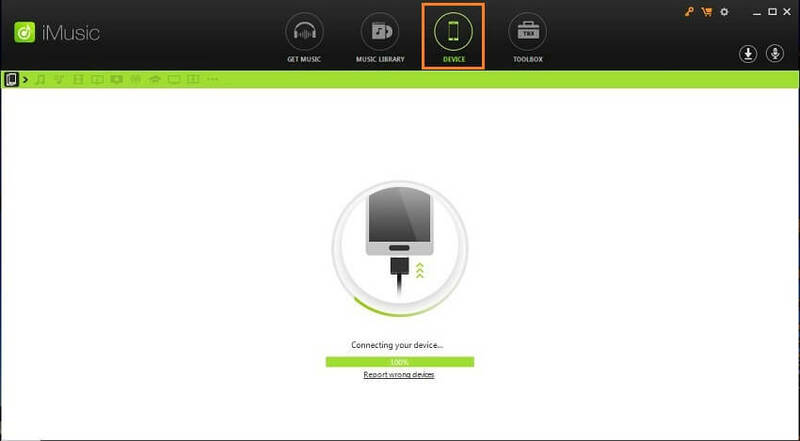 Next, click on “Device” icon and connect your iPhone to your computer using a digital cable. If you have connected your iPhone to computer first time, then click on “Trust” option you get on your iPhone. Once your device is detected by the software, you will get numerous options. And you need to select the “Transfer Music to iTunes” for this case and move forward. Now, you will have further two options to transfer music from your iPhone to iTunes. After you choose the transfer option, click on the “Start” button. Next, you will see all the media files options. And tap on the “Ok” option if you want o copy all media files. Otherwise, you need to un-check the options and check specific media file type you want to transfer and then, click on “Ok” option. This will copy all music from your iPhone to your iTunes library. If you want to transfer only specific music, then click on the “Music” icon located on the left side of the iMusic window. Next, select the music files you want to transfer and then, right-click on the selected ones and choose “Export to iTunes” option. That’s all and your music files will be exported to your iTunes library within a few minutes and you can enjoy your music in your iTunes or computer also. Apart from iMusic software, there are also other good music transfer tools to transfer music from iPhone to iTunes are available on the internet. So, you don’t have to use iTunes as there are alternatives to iTunes that are much better to copy music from iPhone to iTunes. The third-party tools are designed so that users can have a fast and reliable way to transfer data from iPhone to iTunes. So, let’s take a look at some of good music transfer tool you can use. As the software name signifies, it is not just a simple media management tool for the iOS devices, but it is complete iTunes alternative. With the help of this software, you can transfer music, photos, videos and much more between iPhone and iTunes. It quickly detects the connected device and loads all the files present on the device. The software allows you to transfer selected music also from iPhone to iTunes. It is also considered the ultimate iPhone manager. Amazingly, the software is available for both Windows and Mac computer. It is a faster and efficient tool. The tool can rebuild your whole playlist. It let you export your iPhone text messages also. Sometimes, it gets freezes and you need to stop the process to get out this issue. It takes a large amount of time to do some tasks and afterward, it crashes or hangs. SynciOS is another amazing music transfer too that you can use to transfer music from iPhone to iTunes free without using iTunes. With this software, you can manage your songs or music in a much better and efficient way. It is also considered a great alternative to iTunes. 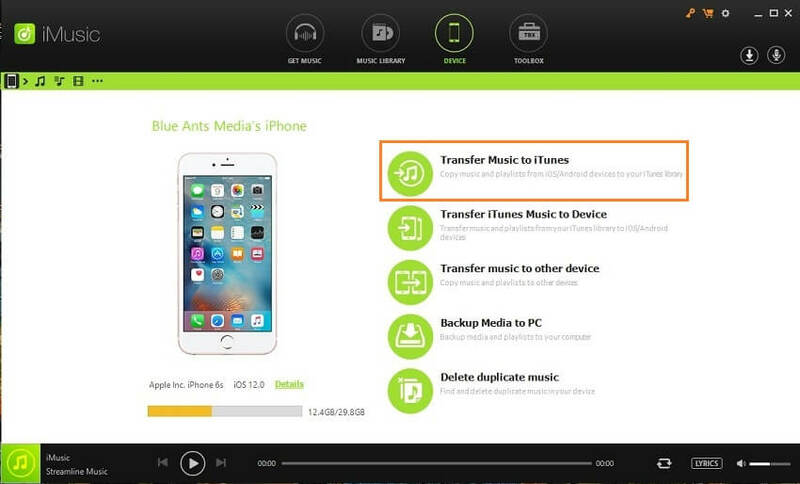 You can transfer not only music but also videos, eBooks and apps from your iPhone to iTunes or iTunes to iPhone. It provides great ways to copy files from iPhone to iTunes/Mac/PC. It is easy to use because of its simple interface. The tool can manage your iPhone files on the computer. The software does not support all music formats. Sometimes, it fails to transfer data like ringtones, audiobooks, etc. The premium package is very expensive. AnyTrans by iMobie is a great file manager designed for iOS devices. It is one of the best alternatives to iTunes in many ways. The tool can transfer any type of file from your iPhone to iTunes or computer. It will let you transfer all music or particular music from iPhone to iTunes or iTunes to the iPhone. It works with every iPhone model without any trouble. It let rebuild your music library with ease. The tool allows you to transfer music or other files between iPhone and computer/iTunes. It is reliable with a permanently unlocked device. It is free to scan your iPhone data, but you need to pay for the transfer. The tool does not provide free updates and customer service. dr.fone - Transfer (iOS) is another good music transfer tool to transfer music from iPhone to iTunes in one-click. It comes with a user-friendly interface that will allow you to copy songs from your iPhone to iTunes within a few minutes. Besides music, it let you transfer other media files, such as photos, videos, messages, and contacts. Transfer media files between iTunes and iOS devices . It supports all iPhone model and iOS version. It let you transfer data between two devices. There is no preview option available. It is not free to use and the trial version comes with the minimum feature. Sometimes, it fails to recognize the connected iPhone. TunesMate by iMyFone is a one-stop solution to copy music from iPhone to iTunes without iTunes. Apart from the music file, it can also transfer movies, photos, podcasts, etc without any hassle. With this software, you can also share your device music. Transfer music purchased from various sources from iPhone to iTunes. It let you transfer music between computer/iTunes and the iPhone. The tool allows you to delete your iPhone files on the computer. It provides a free trial, but you need to pay for more features. Its free trial does not have many features to test the software efficiency. Sometimes, it fails to detect the connected iPhone. Transfer music from iPhone to iTunes with simple clicks. Conclusion: Hopefully, now you know how to transfer music from iPhone to iTunes free with and without iTunes. Among all the ways, it is iMusic that let you transfer all kind of music from your iPhone to your iTunes library without any trouble. So, get this tool and start enjoying your music on the computer too.